The opening of an Oklahoma City location for the popular eat and play chain Dave & Buster's was highly anticipated in 2012. Located on north May Avenue near Northwest Expressway, it came in at nearly 24,000 square feet, about 6,000 more than the location in Tulsa. One who has never been to Dave & Buster's is likely to be impressed by the bevy of gaming delights and flat screen televisions lining the walls, but depending on expectations, there may be some surprises in the areas of food and atmosphere. Here's a full review of Dave & Buster's Oklahoma City. 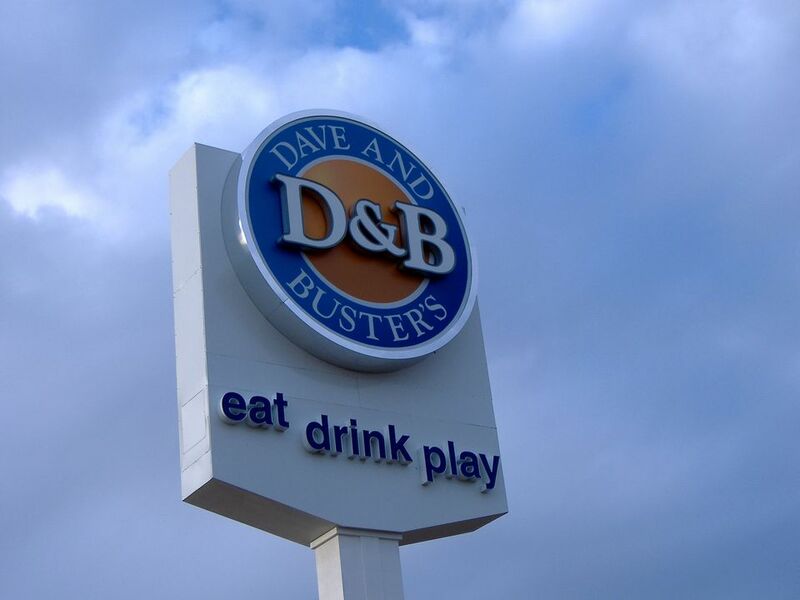 When I walked into the Dave & Buster's in Oklahoma City, just a few days after its grand opening, I held several preconceptions, most of them based on television commercials and word of mouth. "It's like a Chuck E. Cheese's for grown-ups," a friend of mine told me. "Just swap the pizza for hamburgers and add beer." It's a playground for adults, I assumed, a relaxed but jubilant dream house that will take me back to my carefree youth. And in some ways, those ideas were confirmed, but in others... not so much. Greeted at the door by a polite Dave & Buster's employee, we went immediately to the dining area on the right. The place was already packed, and after placing our names on the waiting list for a table, we decided to check out the game room. That's when I noticed the kids, many of them, perhaps even more than the number of adults. An employee informed me of a fairly complicated policy on those under 18 (apparently if you're looking for adults only, you have to go quite late), and needless to say, it was a lesson in the dangers of assumption. If you're like me and your expectation is an adult atmosphere, you too are likely to be disappointed. Groups of teenagers giggled, just like at any other gaming center. Children raced around me, and as I passed a motorcycle game, a woman doggedly racing and leaning to turn a corner, I noticed her sleeping baby placed in its carrier along the walkway. Sure, you're able to make your way through with a beer in your hand, but my hopes of the perfect synthesis between childhood excess and adult leisure quickly evaporated. I get it, of course. Dave & Buster's wants to make money, and the kids are the ones more likely to become obsessed by the notion of an Xbox for "only" 90,000 tickets. Luckily, it wasn't my only surprise of the evening. Though the server told us 25-30 minutes for a table, it couldn't have been more than 10 before we were seated and I was perusing a menu far more interesting and unique than I had considered likely. There are the burgers, sliders, cheese fries, buffalo wings and other bar-type food I thought I'd see, but the fairly extensive list of choices also includes fire-grilled salmon, tropical chicken & shrimp, pastas, steaks, barbecue and even low-calorie selections. My group decided to get, among us all, a broad selection. We started with pub-popular pretzel bites (bready, buttery treats with three kinds of dipping sauce), and our entrees included a bacon cheeseburger with sweet-potato fries, the Black Jack BBQ chicken and the Island Grilled Trifecta with steak, chicken and shrimp. Prices were reasonable, on par with what you might see at other casual chains, and though there were some opening weekend hiccups (forgotten sauce, no bacon on the hamburger), the service was very good. Overall, it was the polar opposite of my previous diatribe; instead of high expectations unsatisfied, the dining was characterized by low expectations surpassed. Along with the large number of food options, the drink menu includes mixed drink specialties and a decent number of beers. I was even surprised to see a selection from local brewery Mustang on tap. It'll be extremely nice to see them expand that in the future. Combined with the diverse food choices and the wall to wall flat-screens, the quieter, dedicated bar area in the middle makes for one of the better sports bar/pub picks in the metro. And if the game you're watching is a blowout, head to the "Million Dollar Midway" to rid yourself of some frustration. If you go to Dave & Buster's, odds are you're there, at least in part, for some games. And here, you have plenty of options, about 140 of them, I believe. You can move around a little bit by throwing a football, playing air hockey, shooting hoops or dancing. And the arcade choices are just as impressive, plenty of racers and shooters. One game that had my group addicted was Pac-Man Battle Royale, a 4-player version of the classic in which you have to eat each other as well as the ghosts. Gone are the days of metal tokens. Instead, purchase and load a Power Card that you swipe at each game. Though far more convenient, it does make it a little more difficult to keep up with your spending, as many games have odd prices such as 7.7 credits. But I suppose that's the point. You'll find many ticket-based games, some that require skill and others that are just random spinning machines. However, you won't find much at all in the redemption room for fewer than 250 tickets. As I didn't play a lot of ticket games, my friend and I had to combine our loot for a lighted Dave & Buster's pen. Both of us told the other he could have it. Still, it was a very fun way to spend an evening, and I will certainly return, even if I only play a game or two while enjoying a sporting event and food from the bar. And if I'm looking for more of an adult atmosphere, I'll go much later in the night. Check out About.com Reader Reviews. As is common in the industry, the writer was provided with complimentary items for the purpose of the review. While it has not influenced this review, About.com believes in full disclosure of all potential conflicts of interest. For more information, see our ethics policy.